Cephalexin is a broad-spectrum antibiotic available in tablets or capsules. Cephalexin is used to treat bacterial infections of the skin, urinary tract, respiratory tract, bones, and joints. Cephalexin is a broad spectrum antibiotic used to treat bacterial infections of the skin, urinary tract, respiratory tract, bones and joints. 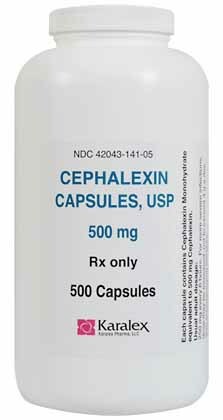 It is available as 250mg and 500mg tablets, and 500 mg capsulesUses: Cephalosporins are a group of related antibiotics used in a wide variety of species for a wide range of infections, most commonly of the skin, urinary tract, bones, and respiratory tract. Often used to treat an infection while waiting for culture results. Possible Side Effects: Side effects are rare. May see lack of appetite, vomiting, or diarrhea. Dogs: May also see drooling, rapid breathing, rashes, and excitability. Cats: May see vomiting, rashes, or fever (temperature greater than 103 degrees). If you observe any of the above signs in your pet, contact your veterinarian. If your pet experiences an allergic reaction to the medication, signs may include facial swelling, hives, scratching, sudden onset of diarrhea, vomiting, shock, seizures, pale gums, cold limbs, or coma. If you observe any of these signs, contact your veterinarian immediately. Precautions: Do not use in animals hypersensitive (allergic) to them. Do not use in animals hypersensitive to penicillins, as they may react to both. Although no fetal abnormalities from cephalosporin use have been documented, do not use in pregnant or lactating animals (female animals nursing their young) if possible, as cephalosporins cross to the fetuses and pass in the milk. Use with caution in animals with seizures, epilepsy, or kidney disease. Consult with your veterinarian regarding the physical examinations and laboratory testing necessary prior to and during treatment with cephalosporins. Human Precautions: People with hypersensitivities (allergies) to cephalosporins or penicillins should not handle any of the cephalosporins, since allergic reactions could occur just from contact. Drug, Food, and Test Interactions: Consult your veterinarian before using cephalosporins with vitamins, supplements, aminoglycosides (gentamicin, neomycin) or amphotericin B, anticoagulants (blood thinners, such as heparin or warfarin), and probenicid, since interactions may occur. May increase blood levels if used with probenicid. Some cephalosporins may affect some tests for urine glucose. May cause a false-positive test result with some brands of urine test strips dipsticks used to check urine glucose. Signs of Toxicity/Overdose: May see vomiting or diarrhea. With high doses or long-term use, may see liver disease, which may cause jaundice (yellowing of the gums, skin, or eyes); kidney damage, usually with increased drinking and urination; blood disorders, which may cause decreased white blood cells and platelets, causing an increased tendency to bruise or bleed; and damage to the nervous system. If you know or suspect your pet has had an overdose, or if you observe any of these signs in your pet, contact your veterinarian immediately. Keep this and all other medications out of the reach of children and pets. ** This information may not cover all possible uses, directions, side effects, precautions, allergic reactions, drug interactions, or withdrawal times. Always consult your own veterinarian for specific advice concerning the treatment of your pet.